heritage variety, because they are friendlier, and a good homesteading breed. They did a wonderful job turning over old pasture, which Otto then plowed and which is now sown in new pasture and looking beautiful. we still got a good haul. The flowers also grew beautifully this year. We expanded our flower offerings to include a flower CSA and wedding design. This bridal bouquet went to a lovely wedding on Lake Crescent in August (see the flower section of our website). This fall, Wendell got his first pair of XtraTufs. We were glad to be prepared for the wettest October on record. It made for a hard year for storage crops, but we still got some beautiful dry corn, which we use to make cornmeal or polenta. Below, our Roy’s Calais Flint shows its colors (right). On the left, Rob and Dana plow in the pig paddock to sow new pasture. One of our last tasks for the fall is planting garlic. We had some friends come help, including little Coretta, who helped us power through over 6000 cloves. We love garlic as a crop because it has the opposite growing season to most other crops: plant in the fall and harvest in the spring. What a great northwest flavor! We thank our customers and volunteers and Rob for all your support this year! We are standing at the brink of spring here on the farm and the seeding has just begun. The garlic is growing, piles of seed are organized, the crop plan is almost complete, fruit trees are being pruned and the 2016 CSA info will be live in the coming days. In the midst of late winter Dana is hard at work planning and dreaming up this year’s flower garden and we would love you be a part of it. We are planning to have flowers available for weddings, farmers markets, other special events, and our farmstand this summer. For more info and photos check out the Flower page and contact Dana with any questions. Strawberries are close to the heart of the matter. We planted 500 Shuksan strawberry plants today. Strawberries are close to the heart of the matter here at Around the Table Farm. We plant our berries using tools made by a man who planted berries here in Kitsap county for nine decades before his death in 2012. Akio Suyematsu’s tools now Karen Selvar’s tools shared among local growers so the berry growing can continue. Akio’s family began clearing land on Bainbridge Island in the 1920’s with the dream of growing berries. The Waldroop family came to our land in the 1940’s with the dream of growing berries. Dana and I came to learn farming on the Suyematsu farm on Bainbridge starting in 2008. At that time Akio was 86 years old and still growing raspberries and strawberries on the land. We bought this piece of ground atop a hill in Poulsbo, the homeplace of an old strawberry farm, on winter solstice 2010. When I told Akio we were moving to the old Waldroop place he had many memories of selling berries alongside the Waldroop family in the both stores and to the canneries. 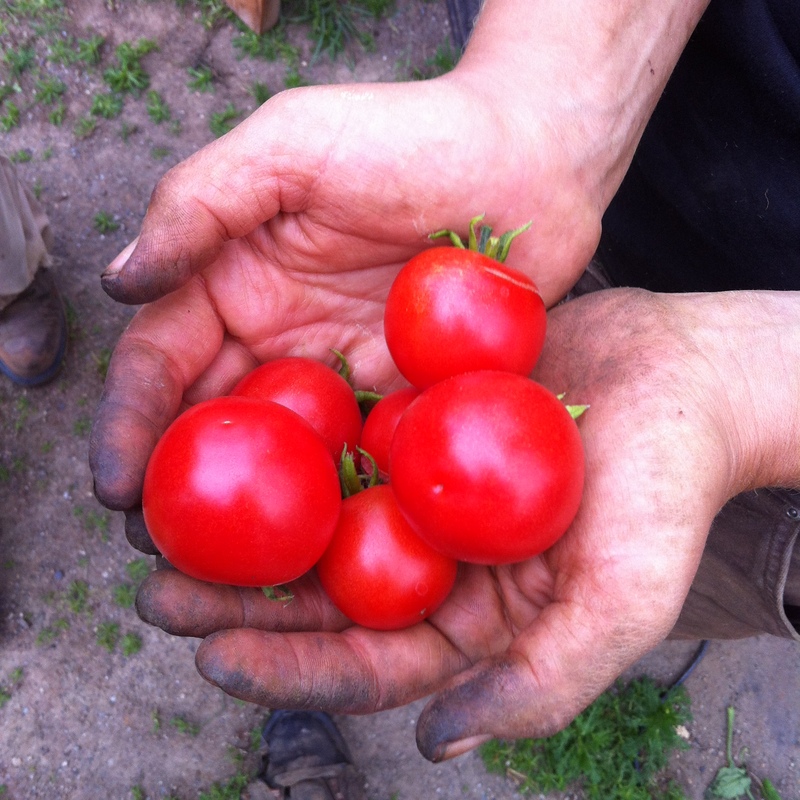 In the spring of 2011 we began planting many things, among them june-bearing Shuksan strawberries. 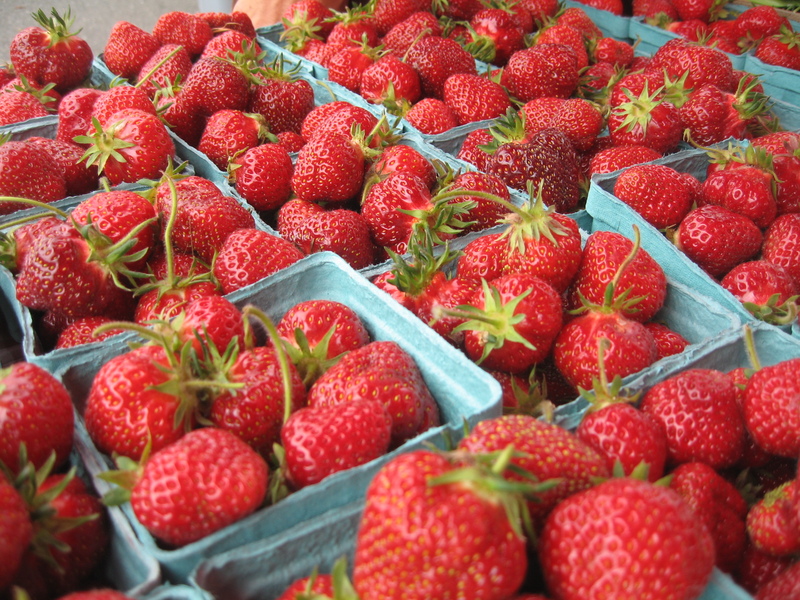 Strawberries are deeply imbedded in the modern agricultural history of this landscape. Canneries and berry farms were very common here at the time of World War II at which time some berry farmers, many Japanese, lost their land during their internment starting in 1942. Until recently almost all cleared land in Poulsbo and Bainbridge Island was former berry farms now soccer fields, subdivisions and public schools as agriculture moved out of Kitsap County. This farm, our farm was bigger once. The son of the original Waldroop farmer was a metal worker at the Port Gamble saw mill and when he retired he subdivided the farm, selling off 5 acre parcels for development. At this time he sold the home place, 5.5 acres, to his son. This 5.5 acres is our farm and we are grateful to be here and humbled by the responsibility. There is surely more to the history of this land than I yet know, my research hardly begun. What I do know has been told to me by farmer Waldroop’s grandson, Akio Suyematsu, and neighbors and longtime Poulsbo residents. What I do know is that strawberries are close to the heart of the matter and we will continue the legacy on this land. . . .before first light on a windy March morning I am awake and thinking about the state of the farm. It is so much more than fields which produce food and animals to sell. This place is a home for us. Over the past four years, our life energy has been poured into these five and a half acres, into the woods, pastures, gardens, orchards and buildings. If you want to know us, who we are and what we have been occupied with, you must know this place. Most of our resources have gone into making this place a home and creating the infrastructure the farm needs to thrive and provide for itself. Although we have accomplished a great deal, our list remains long and there is ever the sense that we are still beginning. I suspect this will continue to be the case for a good many years and this does not worry me, true craft is never mastered. This is the work we signed up for; this creating home; this nurturing of plants and animals which in turn sustains those who share with us the dependance on this land. Grappling with the ‘bigger picture’ helps me to make sense of the demanding repetitive and joyous details of our daily life. . . .one day at a time. . . I can see the moon, a week past full, behind the fir trees and I think that today it will rain, or so they tell me. A great concern for weather is inescapable for folks like us who give our lives to being outside. So we try to pay attention. Using the information we have we attempt to make the best choices possible, when to plant, when to wait, when to water or hope for rain, when to work the soil, when to harvest, how much, how late to stay in the field. . .the list goes on. The light arrives as the definition of blue and the baby is talking in his bed. Another day. . . Turning towards spring. . . The farm is beginning to stir with new life as 2015 begins to assert itself with sunny skies and warmer temperatures. Among the new arrivals this week are four American Guinea Hogs procured from our friends at Second Spring Farm in Rochester, WA and 25 new Black Star laying hens. We have our farmers market applications in [Poulsbo and Wallingford], the new CSA information is available and applications are rolling in, we are seeding flats and beds and starting to work ground in preparation for the field crops. 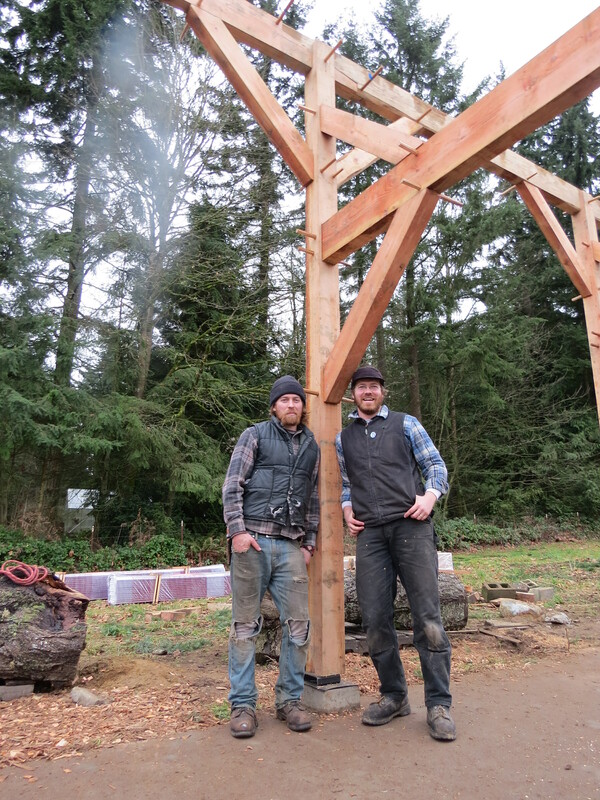 This winter found us busier than we had anticipated as we put up a timber-frame animal barn. This dramatically increases our equipment, grain and hay storage and gives our animals some inside space during the cold and wet months of the year. We have also continued work on our farm house, spent some time visiting family and enjoyed lots of time sitting and reading beside the woodstove. As it seems winter is over here beside the Puget Sound we are turning our faces towards spring and look forward to seeing you all soon at a farmers market near you.